You can add jumbo prawn’s to this rice and or cooked, chopped, boneless chicken to the finished rice. 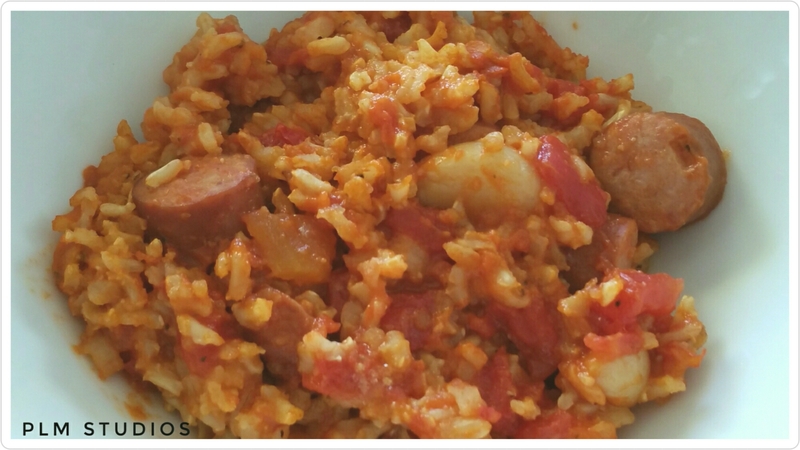 This jambalaya has no beans, but you could surely add your choice of either pinto beans or even cooked black eyed peas, as a kind of Hoppin’ John. I made a small casserole of this, but if you were having a party, as many are now with 2017 counting down in mere days now, just triple the recipe or make as much as you want. You can vary the kind of meat that’s used in this versatile dish. You can vary the kind of stocks used in the dish as well. The V8 is really great when you use the low-sodium variety. It adds about 600 milligrams of potassium per cup. I made it with vegetarian stock but you can use chicken or beef as well. 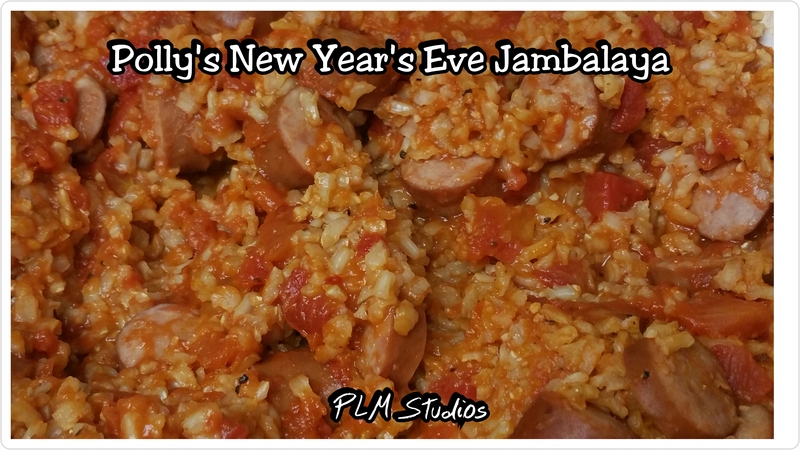 Jambalaya that I had at the Golden Nugget on Christmas it was outstanding. And it had andouille sausage, chicken, and jumbo prawns that which you can add as much as you wanted any of those. 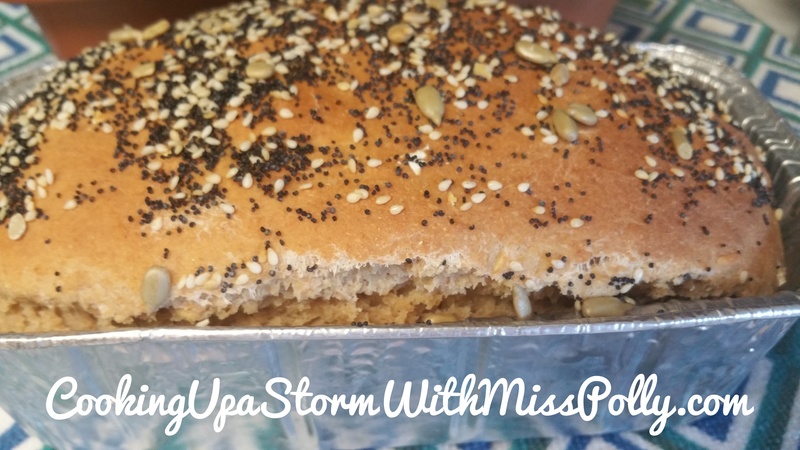 I like recipes that are like a “springboard for your imagination” like this one. 8 peeled whole garlic cloves…. if you don’t like as much garlic, simply add less! 12 ounce’s of Johnsonville turkey sausage with cheddar, cut in half inch slices. Diced onion, bell pepper and celery- 1 cup of each sautéed with some canola oil or olive oil before you add the rice and stock and V8 juice. 1. Saute the diced onion, bell pepper, and celery also known as the Trinity in Creole cooking. 2. After the pepper onion and celery are slightly softened, add in the low sodium V8 juice, and he stuck – whichever kind you decided to use. 3. Bring the temperature up to medium-high and bring to a simmer. Once it starts boiling, cover and turn the heat down to simmer for about 20 minutes until the rice is done. Check the rice in about 20 minutes. If it looks like it needs more cooking just cook it! Also if it seems that it needs a little bit more liquid to it a bit and then cook a little more. Rice is pretty simple stuff. I added the sliced cooked turkey sausage on top of the cooking rice in the steam located throughout. Other additions are cooked chicken and or cooked shrimp if you really want to go all out. Recipe by Paulette “Polly” Motzko. December 29th 2016 at 5:47 p.m. Written by Paulette Motzko and photography by Paulette Motzko.